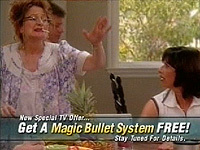 I’ve uploaded a video montage of everyone’s favorite character from the Magic Bullet infomercial, Hazel. Go to the bottom of my review of the Magic Bullet infomercial to play the video. Chopping garlic! Stinky, nasty garlic! Dinner’s always a production. (or to be phonetic: “Dinnuhz always a prudugzion.”). I’ll be adding of similar video montage of hightlights from Berman soon. That scruffy hair! and extra long cigarette ash is terrific! Please get the whole commercial so I can put it on my IPOD! If only the MB were as wonderful as this infomercial! By the way, what’s happened to Nancy Nelson? This infomercial is probably the most addicting of the bunch! My 16 year old cousin says she is addicted to it and has watched it over a hundred times! How many years has this infomercial been on the air? When I first heard about this infomercial it sounded like an item that Mimi would use in the privacy of her bedroom. Maybe that’s why she’s so happy. I hope people out there aren’t confusing the two! Yes – the original commercial. Hazel’s cig never “runs out”. I am pretty sure it is a prop. But in the newer edited version of the commercial, the cig disappears about 1/4 of the way into the commercial. I like to think that this Hazel is a twisted modern day version of the “Hazel” tv show from the 60’s. What is the name of the actress who plays HAZEL?